Ryan Gosling has been tapped to host Saturday Night Live's season premiere, with the beloved late-night show returning this Saturday (Sept. 30). In celebration of the show's highly anticipated return, Gosling and JAY-Z (who is set to perform during the season opener) reunite in a feel-good (and semi-hilarious) new promo skit. During the teaser, Gosling can be found awkwardly recalling how he last saw JAY-Z at Coachella, with the legendary rapper playing along with Gosling's candor and eventually breaking his chill demeanor as the skit unfolds, with the two sharing a nice laugh toward the end. 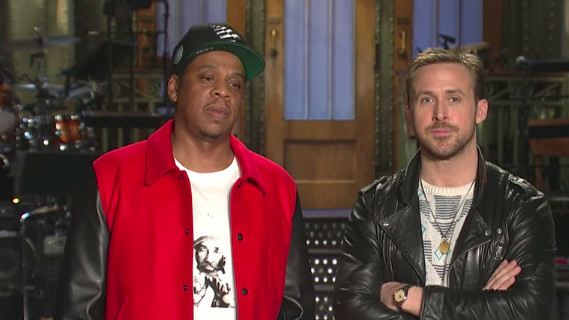 Take a look at Ryan Gosling and JAY-Z having some good clean fun in the clip below, and be sure to check out the premiere of SNL tomorrow night.